The Point England Development Enabling Bill gained passage on Tuesday evening. Currently, 18ha of the 48ha Point England Reserve is used for grazing cows. The Bill requires the cows to be evicted, uses 12ha for housing, 2ha for a Ngāti Paoa marae and increases the recreational and amenity space by 4ha. 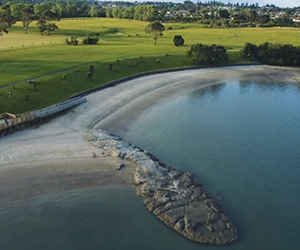 All of the Crown proceeds from the housing development are to be invested in the local community, with enhanced recreational facilities, improved playing fields and for cleaning up the Omaru Creek. The next step will be finalising a development agreement with Ngāti Paoa that will require a minimum 20 per cent social housing and 20 per cent affordable housing, with 2ha to be provided for a marae. The Bill specifically requires the current 8.4ha of playing fields is retained and the intention is that they be enhanced, with proper drainage and lighting. Certain areas are to be protected for coastal birds, such as the New Zealand dotterel. The Bill has been opposed by local groups. The Maungakiekie-Tāmaki Local Board had sought to block the bill on the grounds that it “cuts across the existing requirements of the Resource Management Act and the Reserves Act”, setting a precedent for developers to push for enabling development legislation in order to bypass the public consultation and rights of appeal processes. The Board’s primary concern was a lack of transparency surrounding the deal, in terms the absence of any public consultation relating to the housing development on the reserve land. In its submission, the board noted a deep concern that the bill had fast-tracked development and avoided robust consultation, including a right of appeal.